As we spend time outdoors in the summer at family reunions and picnics, foodborne illnesses increase. When working with food outdoors, the ability to wash hands and keep food refrigerated is often limited. Following a few simple tips can keep you and your food safe. -Pack the ice cooler correctly. It seems simple, but there are some things you can do to keep foods colder, and therefore, safer. A full cooler will keep food cold longer than one that is partially filled. If you don’t have enough food to completely fill a cooler, fill up the rest of the space with ice. Place meats in a separate cooler or on the bottom of the cooler in plastic bags. Put ready-to-eat foods, fruits and vegetables and drinks on top away from meat. Keep the cooler in your air-conditioned car as long as you can and when you reach your destination, place it in the shade. If you are on an extended camping trip, consider placing frozen meat in the cooler. It will stay cold longer and be thawed by the time you are ready to use it. -When grilling, use a meat thermometer to determine if you have cooked the meat to a safe minimum internal temperature. This will destroy harmful bacteria. Meat cooked on a grill often browns very fast on the outside, but has not reached a safe temperature on the inside. Remember these important numbers: Cook ground beef to 160 degrees, poultry breasts and ground poultry to 165 degrees and beef, pork, lamb or veal steaks or chops to 145 degrees and allow to rest for 3 minutes. -Don’t cross-contaminate. Cross contamination happens when raw food comes in contact with cooked food. This can cause foodborne illness. One example is when grilling, raw meat is taken to the grill, cooked and then placed back on the same plate where the raw meat was. Another example is when cutting meat on a cutting board, and the knife and board are not washed. The next item might be watermelon to be sliced. Bacteria from the meat is then transferred to the watermelon, which can cause illness. -When you are outdoors, it can be difficult to wash your hands before preparing food or eating. Make an effort to wash your hands. Especially after handling raw meat. Consider bringing water if the picnic spot or campground doesn’t have any running water. Try to wash all fruits and vegetables before cutting so bacteria is not introduced into the product. For example, melons grow on the ground, allowing harmful bacteria to deposit on the rind. When it is cut, the bacteria is carried into the inside of the melon unless it is washed. -It is tough enough to deal with leftovers when you are in your own home. When you are outside, it can be more difficult, but it has never been more important. Remember to put leftovers away within 2 hours, unless it is higher than 90 degrees. Since bacteria grow fastest at high temperatures, put away perishable foods within 1 hour. -Don’t re-use marinades. If marinades are to be used after cooking, reserve some before putting the raw meat in and contaminating it. -Remember that you can’t see, taste or smell most foodborne bacteria. You may not know it is there until you feel ill.
United States Department of Agriculture. Food Safety and Inspection Service. 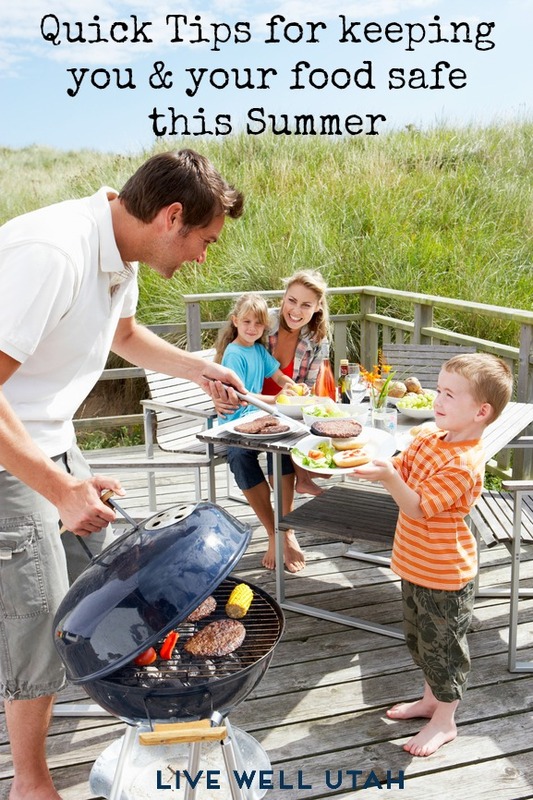 Safe Food Handling: Barbeque Safety.